Oh No! She’s turning blue! I love days when I get to do something special with Amara — like pick her up from school. I had one of those days a few weeks ago. Mommy had some place she had to be so lucky Grandma got to pick her up and bring her home. 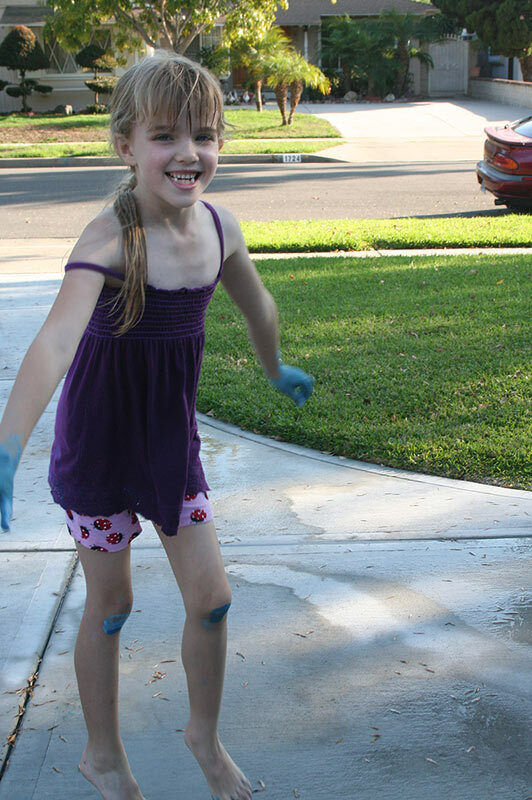 It was a beautiful afternoon so after a long game of tickle bug I let her change into shorts and go outside to play with chalk and the hose. She had a blast getting herself wet and of course I helped. I moved my car so that she could have lots of driveway to use as a chalkboard. 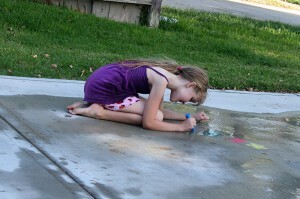 She loves getting herself and the chalk wet and drawing beautiful pictures. She keeps a plastic bowl full of water for dipping. 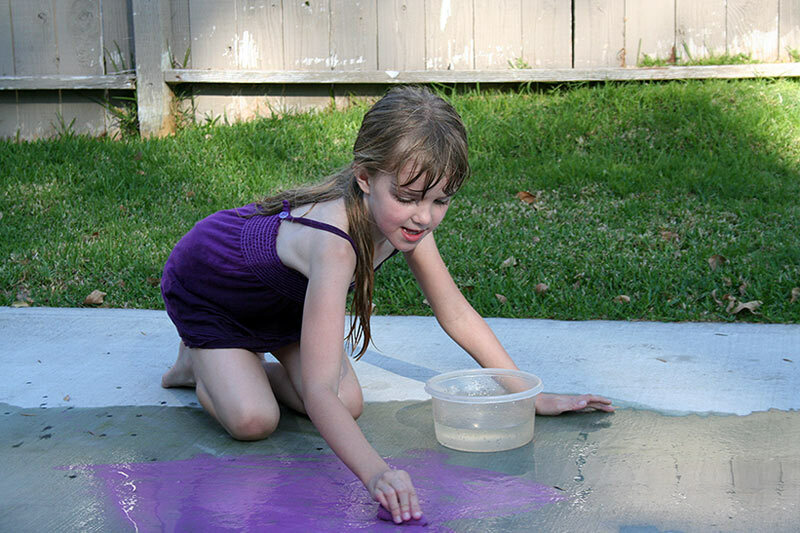 The chalk is much darker when it is wet and goes on heavier so that it is darker when it dries; and she loves to draw. She had so much fun coloring with the chalk that she decided to color herself! 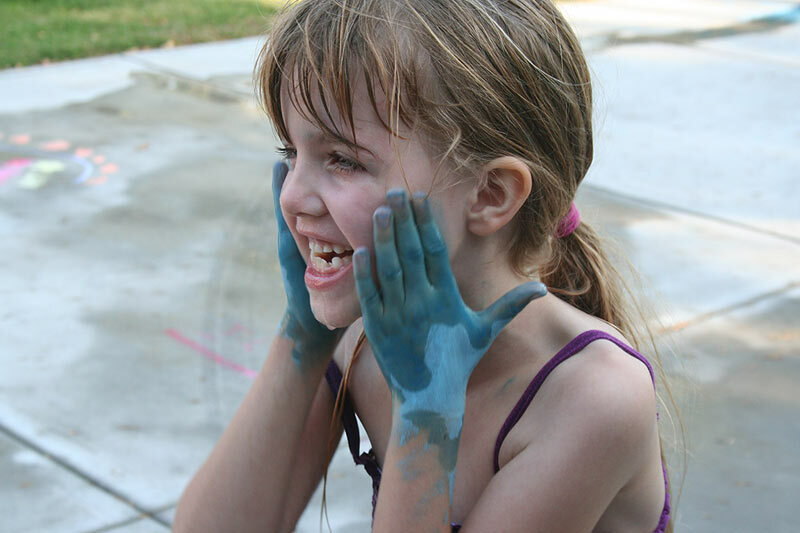 And she decided to color herself blue. The pictures really don’t do her blue condition justice. 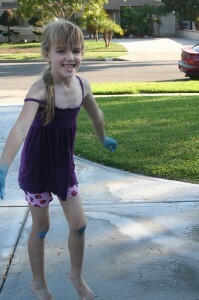 At first she just colored the bottom of her feet in an attempt to make blue foot prints on the driveway. 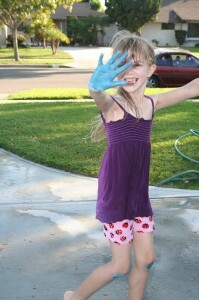 Well that wasn’t enough so she colored her hands blue to make blue hand prints. It really brought out the blue in her eyes! 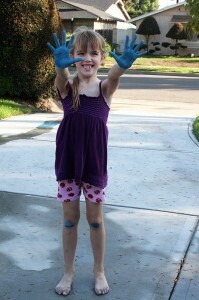 In coloring her hands she knelt down and now had blue knees! Then blue elbows, blue cheeks — blue ears! 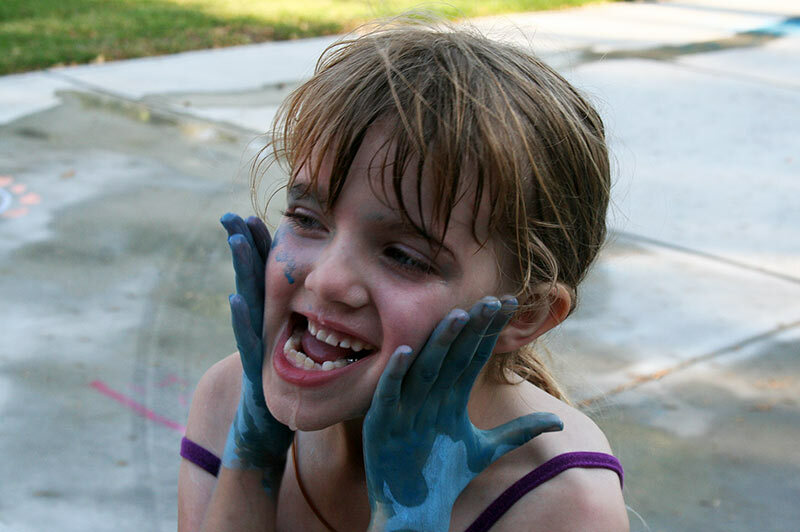 The blue chalk was everywhere. 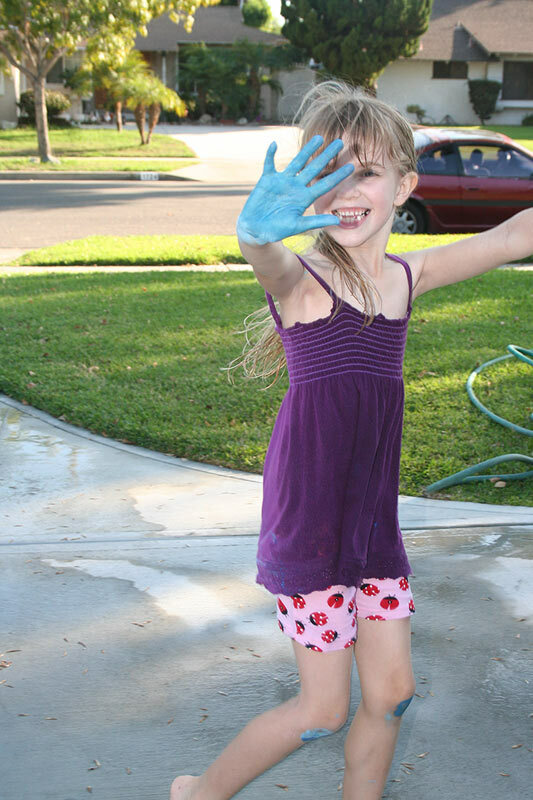 She used her blue hands to make her face blue. That is what we were doing when Grandpa got home. Since it was starting to get chilly I talked her into a bubble bath. I didn’t think I would ever get all the chalk off of her. There will little blue foot prints from the front door to the bathroom! Grampy mopped them up while I dealt with Blue Girl! The bubble bath was lots of fun. She loves mixing different bath gels — maybe she will be a chemist! She did a science project in kindergarten so it is certainly possible. We probably let her be just a bit more loud and crazy than Mom and Dad do — and she was! But that is what Grandparents are supposed to do. 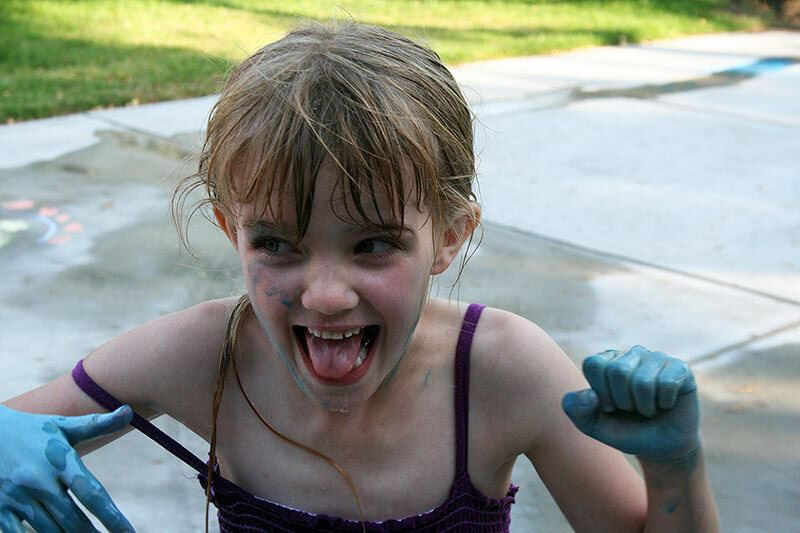 Let them have time to splash and play and be crazy. We’re just building memories! This memory was posted in Outdoors Fun and tagged Amara, art, bubble bath, chalk, Grandma, Grandpa, Previously on Amara, tickle bug, turning blue on October 28, 2010 by Grandma Kc. You are so lucky to be just grandparents and let her do what she likes. We can do that for the other grandchildren but I feel like Tucker and Ben are cheated out of that with us since we have to be parents to them. There are times when we just do a grandparent thing with them to try and balance it all out. She is so adorable. I’ll bet getting her hands all blue was the best park of that activity. She did love having her hands blue and then being able to rub the blue everywhere else! I wish I could have been there to see this! I’m sure she was so full of energy and having the time of her life!! She’s going to have some really fun memories of all these times with you guys! What great pictures! She looks as if she is having the time of her life. I didn’t know about using water with the chalk. I’ll have to try that with my little artists. Thanks Susan! I think your little artists will have fun with it! 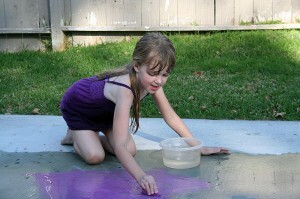 Since my “Wordless Wednesday” blog post involved sidewalk chalk, I had to put a link to your blog in my comments. I hope that’s okay! Of course it is OK! Thank you for sharing my blog. I was there – it was great. Greatest grandchild ever!!!! Since then we have become aware that not only is Amara a very talented, award-winning artist, but she is also a fashion designer (also award-winning) and an Extraordinarily Talented Dancer (Grampy award). The other evening she started dancing to the thirties music from an American Girl movie and she was spot on with the flapper moves – How did she know? Her feet really do “just know where to go”. Also there’s her yellow belt in Tae Kwan Do. And she’s a great cook (Grampy MonkeyBread award). Always looking for new worlds to conquer, she aspires to be an interior designer; the Renaissance woman for the twenty-first century. 2022 – you better be getting ready for a whole new world according to Amara. Now I never knew that about the water and chalk! Oh Deb, they will have so much fun using it with water! Amara also likes to scrap the colored chalk into the Jacuzzi (pink tub) to color the water! And I’ve loved that Target has had chalk on sale pretty much all the time! It is really good, cheap, educational entertainment – even the turning blue part! She is just so much fun! Blue Man Group ain’t got nothing on Blue Amara! I’ll have to try the wet chalk technique with my grandsons. I so totally agree with you on the idea that grandparents are meant to build memories splashing, playing and being crazy. Thank you for linking up to the GRAND Social.